Many men are looking to grow a thicker beard – after all, thick, luxurious beards make up some of the most popular beard styles. The first step towards perfecting your beard is to develop a healthy beard care routine and acquiring grooming tools like best beard brush. In order to grow out your beard and have the most masculine lumbersexual beard out there, you need to commit yourself to the beard growing process. This means purchasing the necessary products to make sure your beard grows in healthy and full. Some of the natural beard shampoos to keep an eye out for are Polished Gentleman Beard Shampoo and Professor Fuzzworthy’s Beard Shampoo. After washing your beard, using some type of beard softener is always a good idea. Beard oil made exclusively of natural ingredients is the best facial hair softener you can ask for. A beard brush is one of the must-have grooming tools for your beard. Although it is difficult to decide which brands make the best balms for beard (because there are a lot to choose from), some of the general bestsellers tend to be the Honest Amish brand and the Rocky Mountain Barber Company. Beard vitamins are also a popular method of adding an extra level of silkiness and support to facial hair. In order to grow out your facial hair, it is imperative to know how to trim a beard. 1. Brush or comb out your beard to detangle it. 2. Use your beard trimmer to evenly cut your facial hair, carefully fading your neck and cheeks if you are going for that style. 3. Comb your mustache to the side, clip to the desired length, and then comb the hairs down and clip any length that hangs over your lips. 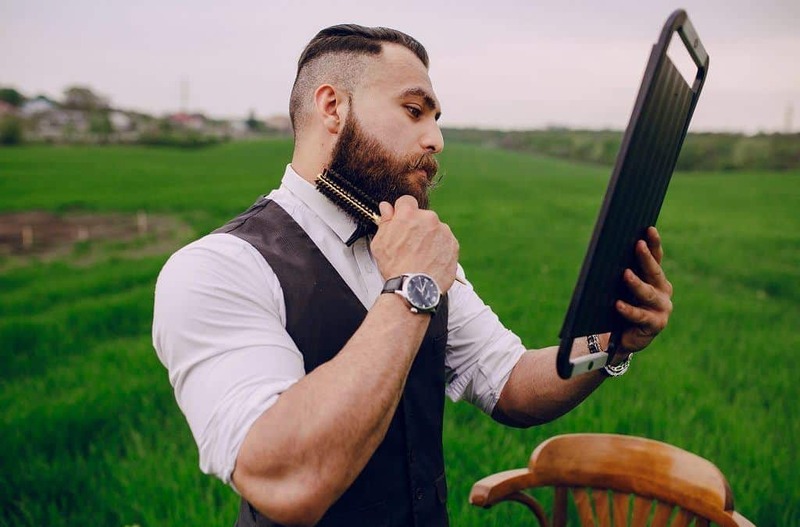 You can use beard comb for this but as a mustache is smaller than the rest of your facial hair, premium quality mustache comb will work much better. 4. Finalize the trim details with a pair of scissors. Equinox Professional Beard Shears will work like a charm because after all, they are not a best seller without a reason. 5. Use some type of beard softener to finish off the job and promote a healthy beard. A quality facial hair brush is a key factor in maintaining a healthy and stylish beard. Before actually trying one out, you might find yourself asking: What are the benefits of using a beard brush? A brush is an essential part of your beard care routine, no matter the length of your beard. When using a beard brush, it is important to know how to brush your beard for the best results. 1. Before brushing, make sure that your beard is dry. 2. Perform the initial brush through to get out any major debris that may have gathered in your beard. 3. Spread a small amount of a beard oil throughout your facial hair. 4. Brush again following the grain of your facial hair, starting at the bottom of your beard. 5. After that, use a brush to shape your beard into the desired style. Choosing the perfect type of facial hair brush can be difficult because of the many options available. After all the effort it took to grow out your thick, luxurious beard, it is important to groom it and keep it looking fresh. Since using a brush is a key factor in your beard care routine, you should feel confident that you are using a quality brush to groom your mane. So how do you find the best beard brush? Luckily, we have thrown together a list of some of the best options out there. Beardoholic Brush features bristles that are made of 100% boar hair – ensuring you will never want to use the cheap synthetic bristled brushes ever again. This brush is designed to help the user maintain coarse facial hair by smoothly gliding through the beard and fending off ingrown hairs without resulting in any irritation. The handle is made of bamboo, completing its lightweight build and stylish look. By helping you distribute the oil evenly through the beard, this product provides gentle moisture, making your facial hair stronger and easier to style. Even after the first use, you will notice fewer tangles, beardruff, debris and crumbs stuck in your beard. Finally, the brush is extremely gentle to your skin and will never cause you any irritation. Very compact – those who prefer a larger brush may want to look into other options. Made to fit into the pockets Grow a Beard Brush allows you to groom your beard no matter where you are. It’s made from a long-lasting and durable bamboo, while the bristles are made of a boar. 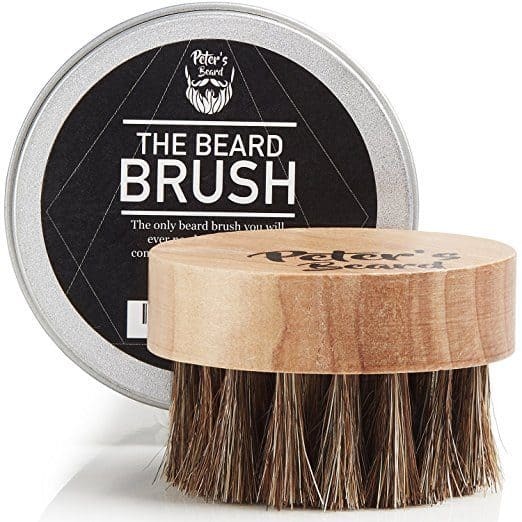 This makes the brush work exceptionally well in removing dirt from your face skin and beard, while also helping you distribute beard oil evenly. The product is also entirely eco-friendly and comes in an elegant package. 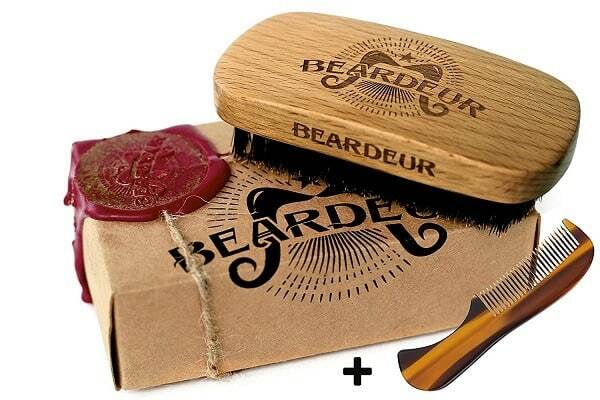 Inside of the pack, there is a wooden beard comb, which makes this set a great present for a bearded man in your life. This set will satisfy most of your beard grooming needs at a bargain deal price. Now, that’s a good balance between the quality and the price. 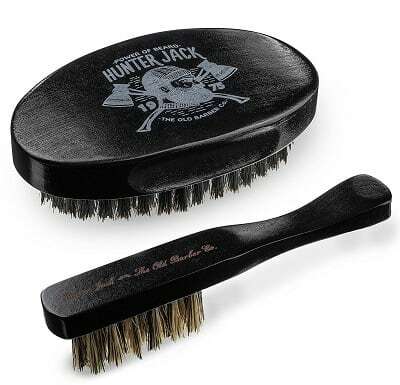 Hunter Jack Brush aims to keep every beard shiny and smooth. This brush comes with two pieces, a larger pocket-sized brush, and a smaller travel sized brush. Both brushes are perfect for different situations, it just depends on the user’s personal beard requirements. 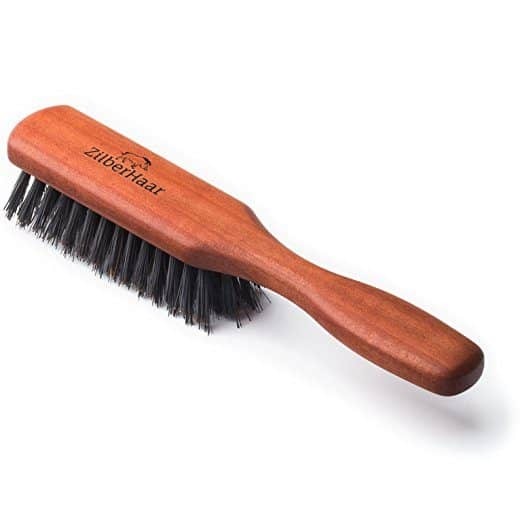 The durable design features 100% natural boar bristles and is great for both home and travel use. With this product, you won’t have to deal with bristles falling off often, as they are very well constructed. You also get a nice wooden comb and a mustache brush inside the package, all of the surprisingly well quality for the price. Like most of the previously listed brushes, Beardeur Brush also has bristles that are made of 100% boar hair. This brush has a great track record and advertises itself as the perfect manly gift. It smooths out any rough scruff and leaves a clean, well-groomed look. After using it, your beard will become much softer and more manageable than ever before. You will also notice that its texture has improved and that it’s cleaner and healthier. The product is designed to provide you with a firm grip for easier control when grooming your facial hair. Its boar bristles distribute a beard oil with ease all throughout your beard. 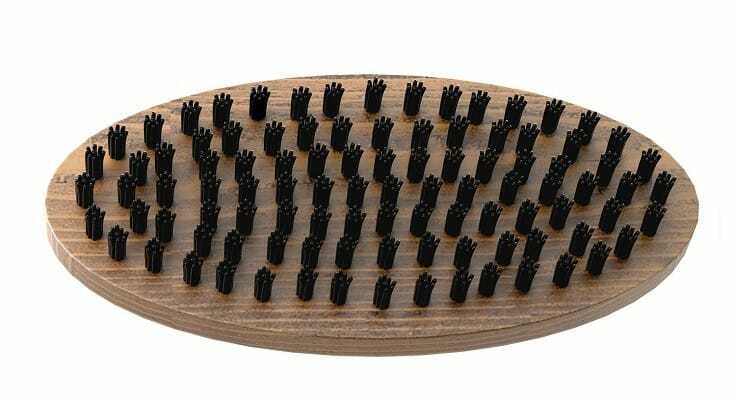 Tombstone Facial Hair Brush has a wooden handle that offers a comfortable grasp and the bristles are synthetically made instead of being natural boar hair. They are made to exfoliate your skin and tame your beard, but you might find them too soft to you if your beard is thicker and coarser. Although you would expect them to be harsh on the skin, that’s not the case and they are perfectly gentle, providing you with maximum comfort. The handle also has an ergonomic shape and is pretty easy to control. There are also a wooden facial hair comb, unscented beard oil, beard balm and small scissors included in the set to cover almost all of your grooming needs. If you often struggle with beard dandruff or dead skin and oil buildups, Peter’s Brush is a product you should have a look at. It’s rather small, but this is excatly what makes it portable and easy to carry around on your travels. A convenient storage and travel container are also included. The brush is rather simple to use and clean. Because of the round shape, it provides a firm grip and feels amazing in the hand. Soft horse bristles make untangling and softening facial hair very easy, but if your beard is too coarse, this probably won’t work for you. With the regular use of ZilberHaar Brush, your facial hair will become softer, healthier and better looking, with less ingrown hairs and itch free. Besides softening your beard, it will also exfoliate and massage your skin, while helping you distribute your oil evenly throughout the facial hair. Known for their numerous benefits, boar bristles on this brush will perfectly glide through your facial mane. Although it works for all beards, if yours is a bit thicker, consider looking for some other option, just in case. The handle is made of pearwood and has a pretty good grip. The bristles of a brush can be either synthetically made, made of natural boar hair, or made of natural horse hair. For the best quality results, boar hair bristles are the recommended option as they are able to spread oil evenly across your beard, giving it a much softer texture. On the flip side, synthetic bristles have the benefit of not doing any harm to animals, although they don’t tend to perform as well as the animal hair brushes. Most handles of facial hair brushes are made of bamboo, but it is not uncommon to see a brush with a plastic handle or a handle that is made out of some other type of wood. The type of handle material you will choose depends on your personal preferences. Wood handles tend to be more durable and aesthetically appealing, but plastic brushes are easier to clean. The bristle stiffness of a brush depends on what the bristles are made of. However, there are pros and cons to both softer and stiffer bristles. Softer bristles have less chance of irritating your skin, but stiffer bristles tend to be more effective in distributing oil throughout facial hair. There is a difference between the two, which is why it is helpful to utilize both in your beard care routine. 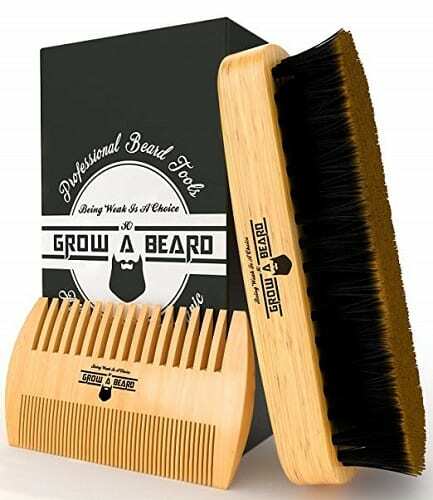 Overall, the biggest difference between the two is that facial hair brushes are used to train the hairs to grow in the desired direction, while beard combs are generally used for detangling and sculpting purposes. While there are travel-sized brushes, beard combs tend to be more portable and smaller. If you use a brush, you should know how to clean it. Start by loosening the hair that is tangled in the brush. This can be messy, so try to use beard bib and trash it to a can. Carefully remove the hair while trying not to pull out any bristles. The last step is to carefully rinse the brush if the material allows it. Photo from: prostooleh / depositphotos.com.